the most basic physical constituents of the universe. ..... Click the link for more information. : a particle that has the same mass but opposite electrical charge and magnetic moment. An isolated quark has never been found—quarks appear to almost always be found in pairs or triplets with other quarks and antiquarks (the resulting particles being classed as hadrons, more than 200 of which have been identified). Four-, five-, and six-quark particles have also been theoretically predicted; there is some experimental evidence for extremely short-lived four-quark particles in the very high-energy environments created by collisions in particle accelerators. ..... Click the link for more information. , and only particles made up of quarks participate in the strong nuclear interaction or force. Other particles, including the electron, muon, and the three neutrinos, do not participate in the strong nuclear interactions but only in the weak nuclear interactions associated with particle decay. (QED), quantum field theory that describes the properties of electromagnetic radiation and its interaction with electrically charged matter in the framework of quantum theory. ..... Click the link for more information. . In 1979 Sheldon Glashow, Steven Weinberg, and Abdus Salam were awarded the Nobel Prize in Physics for their work in demonstrating that the electromagnetic and weak forces are really manifestations of a single electroweak force. A unified theory that would explain all four forces as manifestations of a single force is being sought. ..... Click the link for more information. ; particles obeying the Fermi-Dirac statistics are known as fermions. Leptons and quarks are fermions. Two fermions are not allowed to occupy the same quantum state. Bose-Einstein statistics apply to all particles not covered by the exclusion principle, and such particles are known as bosons. The number of bosons in a given quantum state is not restricted. In general, fermions compose nuclear and atomic structure, while bosons act to transmit forces between fermions; the photon, gluon, and the W and Z particles are bosons. device for detecting charged particles and other radiation by means of tracks of bubbles left in a chamber filled with liquid hydrogen or other liquefied gas. It was invented in 1952 by Donald Glaser. ..... Click the link for more information. . These particles are known as resonances, or resonance states, because of an analogy between their manner of creation and the resonance of an electrical circuit. ..... Click the link for more information. apply both to elementary particles and to microscopic objects, such as the laws governing the conservation of mass-energy, linear momentum, angular momentum, and charge. Other conservation laws have meaning only on the level of particle physics, including the three conservation laws for leptons, which govern members of the electron, muon, and tau families respectively, and the law governing members of the baryon class. ..... Click the link for more information. that can have various orientations in an imaginary space known as isotopic spin space. Isotopic spin is conserved only in the strong interactions. ..... Click the link for more information. principles that apply to changing the total circumstances of an event rather than changing a particular quantity. The three symmetry operations associated with these principles are: charge conjugation (C), which is equivalent to exchanging particles and antiparticles; parity (P), which is a kind of mirror-image symmetry involving the exchange of left and right; and time-reversal (T), which reverses the order in which events occur. According to the symmetry principles (or invariance principles), performing one of these symmetry operations on a possible particle reaction should result in a second reaction that is also possible. However, it was found in 1956 that parity is not conserved in the weak interactions, i.e., there are some possible particle decays whose mirror-image counterparts do not occur. Although not conserved individually, the combination of all three operations performed successively is conserved; this law is known as the CPT theorem. ..... Click the link for more information. . The known quarks and leptons, for instance, are typically grouped in three families (where each family contains two quarks and two leptons); investigators have wondered whether additional families of elementary particles might be found. Recent work in cosmology pertaining to the evolution of the universe has suggested that there could be no more families than four, and the cosmological theory has been substantiated by experimental work at the Stanford Linear Accelerator (now SLAC National Accelerator Laboratory) and at CERN, which indicates that there are no families of elementary particles other than the three that are known today. The basic building blocks of matter. At present the only truly elementary particles containing no internal subcomponents are believed to be leptons and quarks. There are six leptons: the electron, muon, the massive tau lepton, and the three neutrinos. There are also six so-called ‘flavors' of quarks. At one time the constituents of atomic nuclei (neutrons and protons) were thought to be elementary but it is now known that they possess internal structure in the form of triplets of quarks. Particles with quark constituents are called hadrons. Those, like the proton, composed of three quarks are called baryons. Particles known as mesons are produced by a variety of high-energy reactions and decay into stable particles. Mesons, which include the pions, are composed of quark and antiquark pairs. All the visible matter in the Universe can be described in terms of leptons and quarks and the forces acting between them. The simplest theoretical framework for this description is called the standard model. There are four known interactions between elementary particles: the strong interaction (in which only quarks and hadrons can take part), electromagnetism, the weak interaction, and gravitation (see fundamental forces). In the exact sense of the term, elementary particles are primary, indivisible particles that are assumed to be the ultimate constituents of all matter. In contemporary physics, the concept of elementary particles expresses the idea of primordial entities that determine all known properties of the material world, an idea that had its inception in the early formative stages of natural science and that has always played an important part in its development. The concept of elementary particles emerged with the establishment of the discrete nature of a substance’s structure on the microscopic level. The discovery at the turn of the 20th century of the smallest carriers of the properties of a substance—molecules and atoms—and the establishment of the fact that molecules are built up of atoms, made it possible to describe for the first time all known substances as combinations of a finite, albeit large, number of structural components—atoms. The subsequent discovery that atoms are composed of electrons (see) and nuclei and the establishment of the composite nature of nuclei, which were found to consist of only two types of particles (protons and neutrons), considerably reduced the number of discrete elements that form matter (seePROTON and NEUTRON) and led to the assumption that the chain of constituent parts of matter ends in discrete, structureless formations—the elementary particles. Generally speaking, such an assumption is an extrapolation of known facts and cannot be rigorously substantiated. It cannot be stated with certainty that elementary particles in the sense of the given definition exist. For example, protons and neutrons, long considered to be elementary particles, were found to have a composite structure. Moreover, there is a possibility that the sequence of structural components of matter is, in principle, infinite, and it may turn out that the expression “consists of” will become meaningless at some stage in the study of matter, in which case it will become necessary to reject the definition of “elementarity” given above. The existence of elementary particles is a kind of postulate, and proof of its validity is one of the most important problems of physics. The discovery of new microscopic particles of matter gradually destroyed this simple picture. The new particles, however, were in many respects similar to the first four known particles. Their unifying property is that they are all specific forms of the existence of matter that is not grouped into nuclei or atoms (sometimes for this reason they are called subnuclear particles). As long as the number of such particles was not very great, it was believed that they played a fundamental role in the construction of matter, and therefore they were categorized as elementary particles. The ever-increasing number of subnuclear particles and the discovery that many have a composite structure indicated that, as a rule, these particles do not have properties of elementarity; nevertheless, they have retained the traditional name of elementary particles. In conformity with tradition, the term “elementary particles” will be used in this article as the general term for subnuclear particles. In cases where the discussion deals with particles that apparently are the primary constituents of matter, the term “truly elementary particles” will be used where necessary. Brief historical survey. The discovery of elementary particles was a natural outcome of general advances in the study of the structure of matter achieved by physics in the late 19th century. It was preceded by comprehensive investigations of the optical spectra of atoms, by the study of electric effects in liquids and gases, and by the discovery of photoelectricity, X rays, and natural radioactivity, all attesting to the complex structure of matter. Historically, the first elementary particle to be discovered was the electron, the carrier of the elementary negative electric charge in atoms (see). In 1897, J. J. Thomson established that cathode rays were formed by a stream of minute particles called electrons. In 1911, E. Rutherford, in passing alpha particles from a natural radioactive source through thin foils of various materials, found that the positive charge in atoms is concentrated in compact formations—the nuclei. In 1919 he detected, among the particles knocked out of nuclei, protons, particles with unit positive charge and mass 1,840 times the mass of the electron. The neutron, another component particle of the nucleus, was discovered in 1932 by J. Chadwick in studies of the interaction of alpha particles with beryllium. The neutron has a mass close to that of the proton but no electric charge. The discovery of the neutron completed the group of particles that are the structural elements of atoms and atomic nuclei. The discovery of the neutrino, a particle that virtually does not interact with matter, stems from a theoretical conjecture by W. Pauli (1930), who postulated the production of such a particle to resolve the difficulties with the law of conservation of energy in the course of beta decay of radioactive nuclei. It was not until 1953, however, that the existence of the neutrino was experimentally confirmed (F. Reines and C. Cowan, United States). From the 1930’s to the early 1950’s the study of elementary particles was closely linked with research on cosmic rays (seeCOSMIC RAYS). In 1932, C. Anderson discovered the positron (e + ) in cosmic rays, a particle with the mass of the electron but with positive charge. The positron was the first antiparticle (seeANTIPARTICLES) to be discovered (see below). The existence of e +is directly inferred by the relativistic theory of the electron proposed by P. Dirac (1928–31) shortly before the discovery of the positron. In 1936, the American physicists C. Anderson and S. Neddermeyer during investigations of cosmic rays detected muons, with both positive and negative charge, particles whose mass is approximately 200 times the mass of the electron but whose other properties are remarkably similar to those of e– and e+. In 1947, again working with cosmic rays, a group headed by C. F. Powell discovered the π+ – and π– -mesons, particles with a mass of 274 electron masses. These particles play an important role in the interaction of protons with neutrons in the nucleus. The existence of such particles had been predicted by H. Yukawa in 1935. The late 1940’s and early 1950’s were marked by the discovery of a large group of particles with unusual properties, which were named strange particles. The first such particles, the K + – and K– -mesons, ⋀, and the hyperons Σ+, Σ–, and ≡–, were discovered in cosmic rays. Subsequent discoveries of strange particles were made using accelerators, installations that produce intense streams of fast protons and electrons. Upon collisions with matter, the accelerated protons and electrons give rise to new elementary particles, which then become objects of study. Since the early 1950’s, accelerators have been the principal tool for studying elementary particles. In the 1970’s the energies imparted to particles by accelerators amounted to tens and hundreds of billions of electron volts (GeV). The continuing efforts to increase particle energy still more are related to the fact that high energies make it possible to study the structure of matter at shorter distances in proportion to the energy of the colliding particles. Accelerators have greatly increased the pace of acquisition of new data and in a short period have expanded and enriched our knowledge of the properties of the microworld. The use of accelerators to study strange particles made possible a more detailed investigation of their properties, especially their decay, and soon led to an important discovery (1956): the possibility of changes in the characteristics of certain microprocesses under the operation of mirror inversion (seeSPACE INVERSION)—the violation of parity (seePARITY). The introduction of proton accelerators with energies of billions of electron volts led to the discovery of the heavy antiparticles: the antiproton (1955), the antineutron (1956), and the antisigma hyperons (1960). The heaviest hyper-on, Ω –, with a mass of about two proton masses, was discovered in 1964. In the 1960’s a large number of extremely unstable particles (in comparison with other unstable elementary particles), called resonances, were discovered using accelerators. The masses of most resonances exceed the mass of the proton. The first member of this class, Δ1 (1232), has been known since 1953. It has been found that resonances make up the major portion of the elementary particles. It was learned in 1962 that there are two different neutrinos: the electron neutrino and the muon neutrino. In 1964, during the decay of neutral K-mesons, it was detected that combined parity is not conserved (the concept of combined parity was introduced by Chen Ning Yang and Tsung Dao Lee and, independently, by L. D. Landau in 1956; seeCOMBINED INVERSION). This discovery necessitated the reexamination of the customary views about the behavior of physical processes under the operation of time reversal (seeCPT THEOREM). The ψ particles, which are three to four times more massive than protons and which at the same time are relatively stable, with an unusually long lifetime for resonances, were discovered in 1974. These particles proved to be closely related to a new family of particles—charmed elementary particles—whose first representatives, D°, D +, and ⋀c, were discovered in 1976. The first indications of the existence of a heavy analog of the electron and muon—the heavy lepton τ—were seen in 1975. The Y particles, with a mass of the order of ten proton masses, were discovered in 1977. Thus, in the years since the discovery of the electron, an enormous number of diverse microparticles of matter have been discovered. The world of elementary particles has been found to be rather intricately structured. The properties of the discovered elementary particles have turned out to be unexpected in many respects, and their description has necessitated the introduction of many new, special characteristics in addition to those borrowed from classical physics, such as electric charge, mass, and angular momentum. In particular, the characteristic of strangeness (seeSTRANGENESS NUMBER) has been introduced to describe the strange elementary particles (M. Gell-Mann and K. Nishijima, 1953) and charm to describe the charmed elementary particles (the American physicists J. Bjorken and S. Glashow, 1964). The very names of these characteristics reflect the unusual nature of the properties of elementary particles that they describe. Quantum field theory, which is still in the process of development and refinement, provides the basis for the description of the interactions of elementary particles. While a number of considerable advances have been made in this theory, it is still a long way from being complete and cannot claim to be a universal theory of elementary particles. The origin of many properties of elementary particles and the nature of their intrinsic interactions to a large extent still remain unclear. Before the theory of elementary particles is finally constructed, it is quite possible that there will be more than one reexamination of all ideas, and a far deeper understanding may be needed of the relationship between micro-particles and the geometric properties of space and time. Fundamental properties; classes of interactions. All elementary particles are objects of exceptionally small mass and size. Most have masses of the order of magnitude of the proton mass, equal to 1.6 × 10–24 g; only the mass of the electron, equal to 9 × 1028 g, is significantly smaller. The experimentally determined sizes of the proton, neutron, and ir-meson are of the order of 10–13 cm. It has not been possible to determine the dimensions of the electron and muon, but it is known that they are smaller than 10–15 cm. The microscopic masses and sizes of the elementary particles are responsible for the quantum specifics of their behavior. The characteristic wave lengths that must be assigned to the elementary particles in quantum theory (ℏ/mc, where h is Planck’s constant, m is the mass of the particle, and c is the velocity of light) are close in order of magnitude to the typical dimensions wherein particle interaction occurs; for example, for the π-meson, ℏ/mc ≈ 1.4 × 10–13 cm. It is this that makes quantum laws a determinative factor for elementary particles. The most important quantum property of all elementary particles is their capacity for production and annihilation (emission and absorption) upon interaction with other particles. In this respect, they are very much like photons. Elementary particles are specific quanta of matter, or more precisely, quanta of the corresponding physical fields (see below). All processes involving elementary particles proceed through a sequence of events of particle absorption and emission. Only on this basis can one understand, for example, the production of a π+ -meson upon the collision of two protons (p + p → p + n + π+) or the annihilation of an electron and positron, when in place of the vanished particles there arise, for example two gamma quanta (e– + e– → γ + γ). Even the elastic scattering of particles, such as e– + p → e– + p, involves the absorption of the initial particles and the production of the final particles. The decay of unstable elementary particles into lighter particles, accompanied by the liberation of energy, conforms to the same regularity and is a process in which the products of decay arise at the instant of decay itself and do not exist before this instant. In this respect, the decay of an elementary particle is like the decay of an excited atom into an atom in the ground state and a photon. The following may serve as examples of decays of elementary particles: n→ p + e– + v̄e, π+ → µ– + vµ and K– → π+ + π° (here and below the bar over the particle symbol denotes the corresponding antiparticle). The various processes in which elementary particles participate differ markedly in intensity. Accordingly, elementary particle interactions can be phenomenologically divided into several classes, namely, the strong, electromagnetic, and weak interactions. In addition, all elementary particles exhibit the gravitational interaction. The strong interactions are interactions that engender processes that proceed with greater intensity than all other processes. They are responsible for the strongest bonding of elementary particles. It is precisely the strong interactions that bind the protons and nucleons in the atomic nucleus and are responsible for the exceptional strength of these formations, which is the basis for the stability of matter under terrestrial conditions. The electromagnetic interactions are interactions based on coupling with an electromagnetic field (see). The processes that they engender are less intense than those of the strong interactions, and the resulting bonding of elementary particles is noticeably weaker. The electromagnetic interactions are responsible, in particular, for binding electrons to atomic nuclei and for binding the atoms in molecules. The weak interactions, as their name implies, cause processes that proceed very slowly. The low intensity of these interactions is evidenced by the fact that neutrinos, which exhibit only the weak interactions, pass unimpeded through the earth and the sun. The weak interactions are responsible for the slow decay of the quasi-stable elementary particles. The lifetimes of the majority of these particles lie in the range of 10–6 to 10–10 sec, whereas typical times for the strong interactions are 10–22 to 10–24 sec. The gravitational interactions, which are readily evident from their macroscopic manifestations, have little effect on elementary particles at characteristic distances of ~ 10–13 cm because of the small masses of the particles. The strength of the various classes of interactions can be approximately characterized by dimensionless parameters, involving the squares of the constants for the corresponding interactions. For the strong, electromagnetic, weak, and gravitational interactions of protons at an average energy of the process of ~1 GeV, these parameters are related as 1:10–2:10–10:10–38. The necessity for specifying the average process energy is dictated by the fact that for the weak interactions the dimensionless parameter depends on energy. Moreover, the intensities themselves of different processes likewise are dependent on energy in different ways. As a result, the relative role of the various interactions, generally speaking, varies with increasing energy of the interacting particles, such that the subdivision of interactions into classes based on a comparison of process intensities can be reliably done at energies that are not too high. However, the various classes of interactions also have other features involving their various symmetry properties (seeSYMMETRY in physics), that make possible their subdivision at higher energies as well. It is still not clear whether such a subdivision of interactions into classes will remain valid at the highest energies. All the elementary particles studied thus far except the photon are divided into two main groups according to the types of interactions in which they participate: hadrons (from the Greek hadros, “large” or “strong”) and leptons (from the Greek leptos, “small,” “thin,” or “light”). Hadrons are characterized primarily by the fact that they participate in the strong interactions, as well as in the electromagnetic and weak interactions, whereas leptons participate only in the electromagnetic and weak interactions. (The presence of the gravitational interactions, which are common to both groups, is assumed.) The masses of the hadrons are close in order of magnitude to the mass of the proton (mp); the π-meson has the smallest mass among the hadrons: mπ ≈ 1/7(mp). The masses of the leptons known up to 1975–76 were small, ≲0.1 mp; however, more recent data apparently suggest the existence of heavy leptons, with the same masses as hadrons. The first hadrons to be studied were the proton and the neutron, and the first lepton to be studied was the electron. The photon, which exhibits only the electromagnetic interactions, cannot be classified with either the hadrons or the leptons and constitutes a separate group. Concepts developed in the 1970’s place the photon, a particle with zero rest mass, into a group with very massive particles, the intermediate vector bosons, which are responsible for the weak interactions but have not yet been experimentally observed (see below: Elementary particles and quantum field theory). Characteristics. Each elementary particle, along with the particulars of its intrinsic interactions, is described by a set of discrete values of specific physical quantities, or the characteristics of the given particle. In a number of instances, these discrete values are expressed in terms of integers or fractions and some common multiplier—the unit of measurement; these are the quantum numbers of the elementary particles, and they are given without the units of measurement (seeQUANTUM NUMBERS). Common characteristics of all elementary particles are mass (m), lifetime (τ), spin (J), and electric charge (Q). As yet, there is little understanding of the law that governs the distribution of the masses of elementary particles or whether there is some common unit of measurement for these masses. Elementary particles are subdivided, depending on lifetime, into stable particles, quasi-stable particles, and unstable particles (resonances). Particles that are stable, within the limits of accuracy of contemporary measurements, are the electron (τ > 5 × 1021 years), the proton (τ > 2 × 1030 years), the photon, and the neutrino. Quasi-stable particles include particles that decay through the electromagnetic and weak interactions; their lifetimes are more than 10–20 sec (for the free neutron, even ~1,000 sec). Resonances are elementary particles that decay through the strong interactions; their characteristic lifetimes range from 10–22 to 10–24 sec. In some cases, the decay of heavy resonances (with masses of 3 GeV or more) is suppressed through the strong interactions, and the lifetime is extended to ~10–20 sec. The spin of an elementary particle is an integral or half-integral multiple of ℏ The spin of π- and K-mesons in these units is equal to zero; for the proton, neutron, and electron, J = 1/2, and for the photon J = 1. There exist particles that have even higher spin. The value of the spin of an elementary particle determines the behavior of an ensemble of like (identical) particles, that is, the statistics of such particles (W. Pauli, 1940). Particles with half-integral spin conform to Fermi-Dirac statistics (hence the name fermions), which requires the antisymmetry of the wave function of the system relative to the interchange of a pair of particles (or an odd number of pairs) and hence “forbids” two particles with half-integral spin to be in the same state (the Pauli exclusion principle). (SeeFERMI-DIRAC STATISTICS-, FERMION; WAVE FUNCTION; and PAULI EXCLUSION PRINCIPLE.) Particles with integral spin conform to Bose-Einstein statistics (hence the name bosons), which requires a symmetric wave function relative to the interchange of particles and permits any number of particles to be in the same state (seeBOSE-EINSTEIN STATISTICS and BOSON). The statistical properties of elementary particles are important in cases where several identical particles are formed upon production or decay. Fermi-Dirac statistics also plays an important role in the structure of nuclei and determines the regularities of electron filling of atomic shells that underlie D. I. Mendeleev’s periodic table of the elements. The electric charges of the elementary particles studied thus far are integral multiples of the quantity e ≈ 1.6 × 10–19 coulomb, which is called the elementary electric charge. For the known elementary particles, Q = 0, +1, +2. In addition to the aforementioned quantities, the elementary particles are also characterized by a series of quantum numbers known as internal quantum numbers. Leptons carry a specific lepton charge of two types: electronic (Le) and muonic (Lµ); Le = + 1 for the electron and electron neutrino, and Lµ = + 1 for the negative muon and the muon neutrino (seeLEPTON CHARGE). The heavy lepton τ and its associated neutrino are apparently the carriers of a new type of lepton charge, Lτ. For hadrons, L = 0, which is still another manifestation of their difference from leptons. In turn, a special baryon charge B (ǀBǀ = 1) must be assigned to a considerable number of hadrons (seeBARYON CHARGE). Hadrons with B = + 1 form the subgroup of baryons (seeBARYONS), including the proton, the neutron, the hyperons, and baryon resonances, while hadrons with B = 0 form the subgroup of mesons, including the π- and K-mesons and boson resonances. The names of the hadron subgroups are derived from the Greek words barys (“heavy”) and mesos (“middle”), which in the early stages of elementary particle research reflected the comparative values of the masses of baryons and mesons then known. Later research showed that the masses of baryons and mesons are comparable. For leptons, B = 0. For the photon, B = 0 and L = 0. The baryons and mesons are subdivided into several groups, as already mentioned above: ordinary (nonstrange) particles (the proton, the neutron, and the π-mesons), strange particles (the hyperons and the K-mesons), and charmed particles. Special quantum numbers correspond to this division of hadrons: strangeness S and charm Ch with permissible values of ǀSǀ = 0,1, 2, 3 and ǀChǀ = 0, 1, 2, 3. For ordinary particles, S = 0 and Ch = 0; for strange particles, ǀSǀ ≠ 0 and Ch = 0; and for charmed particles, ǀChǀ ≠ 0 and ǀSǀ = 0, 1, 2. Intrinsic parity P, which is associated with the operation of space inversion, is likewise an important characteristic of hadrons: P takes on the values ± 1. (truly) neutral. Absolutely neutral hadrons have a special quantum number, charge parity C, that is, parity with respect to the operation of charge conjugation (seeCHARGE CONJUGATION). The number C can take the value ± 1. The photon and π° are examples of such particles. The quantum numbers of elementary particles are divided into rigorous numbers (that is, numbers that are associated with physical quantities that are conserved in all processes) and nonrigorous numbers (for which the corresponding physical quantities are not conserved in some processes). Spin J is associated with the strict law of conservation of angular momentum and therefore is a rigorous quantum number. The other rigorous quantum numbers, at least according to the accuracy level of contemporary experiments, are Q, L, and B. The stability of the proton is a direct expression of the conservation of B; for instance, there is no such decay as p→ e+ + γ. However, most quantum numbers of hadrons are nonrigorous. Isotopic spin is conserved in the strong interactions but not in the electromagnetic and weak interactions. Strangeness and charm are conserved in the strong and electromagnetic interactions but not in the weak interactions. The weak interactions also change intrinsic and charge parity. Combined parity CP is conserved with much greater exactness, but even it is violated in some processes brought about by the weak interactions. The reasons for the nonconservation of many quantum numbers of hadrons are unclear and apparently involve both the nature of these quantum numbers and the deep structure of the electromagnetic and weak interactions. Conservation or nonconservation of specific quantum numbers is one of the intrinsic manifestations of differences in the classes of elementary particle interactions. Table 1 lists the best known elementary particles of the lepton and hadron groups and their quantum numbers. The photon has been separated into a special group. Particles and antiparticles are listed separately (the change of the sign of P for the antibaryons and of S and Ch for all the antiparticles is not indicated). The absolutely neutral particles are listed between the columns for particles and antiparticles. The asterisk at the left denotes resonances, for which the lifetime τ is replaced by the more convenient quantity I′ = ℏ/τ, the resonance width. The members of a multiplet are placed on one line, sometimes with a small displacement (in cases where the characteristics of each member of the multiplet are given). 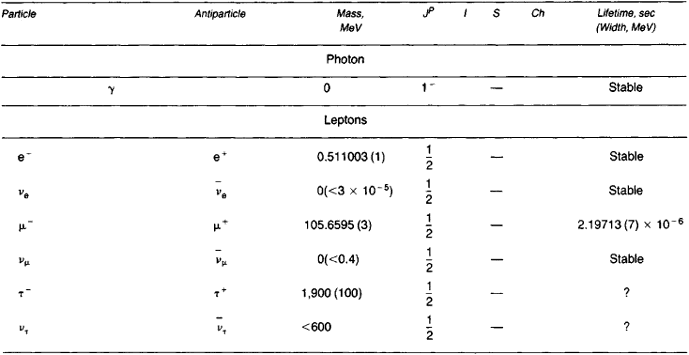 Table 1 shows that leptons are represented by a comparatively small number of particles: the electron, the muon, and the τ-lepton and their corresponding neutrinos. The masses of ve and vμ are very small, but only future experiments will show whether or not they are exactly zero. Information on the mass of vτ is thus far limited. Hadrons make up most of the elementary particles, and the increase in the number of elementary particles in the 1960’s and 1970’s was through the expansion of this group. Most of the hadrons are represented by resonances, for which a tendency for spin to increase has been observed with increasing resonance mass. This can be clearly traced in the different groups of mesons and baryons with given I, S, and Ch. It should also be noted that strange particles, particularly the quasi-stable particles, are somewhat heavier than ordinary (nonstrange) particles and that charmed particles are heavier than strange particles. Classification, UNITARY SYMMETRY. Thus far the classification of leptons has posed no problems. On the other hand, the large number of hadrons, known as far back as the early 1950’s, prompted the search for regularities in the distribution of the masses and quantum numbers of the baryons and mesons that may perhaps serve as a basis for classification. The isolation of the isotopic multiplets of hadrons was the first step in this direction. From the mathematical viewpoint, the grouping of hadrons into isotopic multiplets reflects the presence of symmetry in these particles associated with a rotational group, more formally with the group SU2, a group of unitary transformations in complex two-dimensional space. It is assumed that these transformations occur in some specific inner space—isotopic space—that is different from ordinary space. The existence of isotopic space is manifested only in the observed symmetry properties. In mathematical language, isotopic multiplets are irreducible representations of the symmetry group SU2. Common to all particles in a supermultiplet is a pair of numbers that are similar in mathematical formalism to isotopic spin and are therefore frequently called unitary spin. For the octet, the values associated with these quantum numbers are (1, 1), and for the decuplet, (3,0). Unitary symmetry is less rigorous than isotopic symmetry. Accordingly, there is a rather considerable difference in the masses of the particles that make up octets and decuplets. For the same reason, the grouping of hadrons into supermultiplets is comparatively simple for elementary particles of low mass. It is less reliable in the case of large masses, since many different particles of large mass have similar masses. However, the properties of elementary particles strongly suggest unitary symmetry. The inclusion of charmed hadrons in the systematization of elementary particles carries implications of hypersupermultiplets and the existence of an even wider symmetry, associated with the unitary group SU4. There are as yet no examples of completely filled hypersupermultiplets. SU4 symmetry is violated even more strongly than SU3 symmetry, and its manifestations are less pronounced. The discovery in hadrons of symmetry properties associated with unitary groups and the discovery that hadrons can be grouped into multiplets that follow the strictly defined representations of unitary groups laid the foundations for the possibility of the existence of special structural elements, called quarks, in hadrons. QUARK MODEL OF HADRONS. The development of research related to the classification of hadrons was accompanied from the outset by attempts to isolate even more fundamental particles, which may become the basis for the construction of all hadrons. This line of research was begun by E. Fermi and Chen Ning Yang (2949), who hypothesized that the nucleon (N) and antinucleon (N̄) were precisely such fundamental particles and that the π-mesons were their bound states (NN̄). Strange baryons were also included among the fundamental particles as this idea was developed further (M. A. Markov, 1955; the Japanese physicist S. Sakata, 1956; L. B. Okun’, 1957). Models constructed on this basis provided a good description of meson multiplets but did not describe baryon multiplets correctly. The most important feature of these models, the use of a small number of fermions to “construct” the hadrons, has become an integral part of the quark model, the model that has proved the most successful in describing all the hadrons (the Austrian physicist G. Zweig and, independently, M. Gell-Mann, 1964). The original quark model was based on the assumption that all the known hadrons consist of three types of particles with spin 1/2—the p, n, and λ quarks—which are not any of the observed hadrons and which have quite unusual properties. The term “quark” was taken from a novel by J. Joyce (seeQUARKS). The current version of the quark model assumes the existence of a minimum of four quarks, the fourth quark c being necessary to describe charmed hadrons. The idea of quarks is suggested by unitary symmetry. The mathematical structure of unitary groups makes it possible to describe all representations of the group SUn, and consequently all hadron multiplets, on the basis of the simplest group representation containing n components. There are three such components in the case of the group SU3. It is necessary only to assume that there are particles associated with this simplest representation, and these particles are the quarks. The quark structure of mesons and baryons was deduced from the fact that supermultiplets of mesons as a rule contain eight particles, whereas supermultiplets of baryons contain eight and ten particles. This regularity is readily reproduced if we assume that mesons consist of a quark q and an antiquark q̄, written M = (qq̄), whereas baryons consist of three quarks, written B = (qqq). In view of the properties of the group SU3, the nine mesons are grouped into supermultiplets of one and eight particles, and the 27 baryons are divided into supermultiplets containing one, ten, and doubly eight particles, which indeed explains the observed isolation of octets and decuplets. All experimental data agree well with the given quark structure of hadrons. Apparently there are only slight deviations from this structure, which have no significant effect on the properties of hadrons. 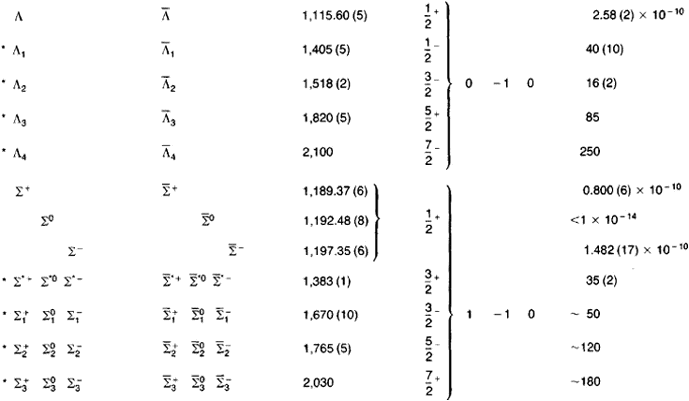 The given structure of hadrons and the mathematical properties of quarks as objects associated with a definite (simplest) representation of the group SU4 lead to the quantum numbers of quarks shown in Table 2. A remarkable feature is the unusual fractional values of Q and B, which are not encountered in any of the observed elementary particles. The superscript a associated with each type of quark qi (i = 1, 2, 3, 4) denotes “color,” a unique characteristic of quarks that is not observed in the investigated hadrons. It assumes values of 1, 2, or 3, that is, each type of quark qi is represented by three varieties (N. N. Bogoliubov and co-workers, 1965; the American physicists Y. Nambu and M.-Y. Han, 1965; the Japanese physicist Y. Miyamoto, 1965). The quantum numbers of each type of quark do not change with changes in color, and therefore Table 2 applies to quarks of any color. where ∈αβγ is a completely antisymmetric tensor and and are normalization factors. It is important to note that neither mesons nor baryons carry color superscipts (they are colorless), and consequently they are sometimes called white particles. The masses of the quarks are not given in Table 2. Because quarks thus far are only the component parts of hadrons and have not been observed in the free state, there are no direct data on the masses of quarks. On the basis of the magnitudes of the masses of the different bound states of quarks (ordinary, strange, and charmed hadrons), we can only conclude that mp ~ mn < mλ ≪ mc. The diversity of hadrons arises from different combinations of the p, n, λ, and c quarks that form the bound states. Ordinary hadrons have corresponding bound states consisting only of p and n quarks, with the possibility of the combinations (λλ̄) and (cc̄) for mesons. The presence of a single λ or c quark in the bound state along with p and n quarks means that the corresponding hadron is strange (S = –1) or charmed (Ch = + 1). The baryon structure may include two and three λ quarks (or c quarks); that is, doubly and triply strange (or charmed) baryons are possible. Combinations of different numbers of λ and c quarks are also possible, especially in the baryons; these combinations correspond to “hybrid” forms of hadrons (“strange-charmed”). Obviously, the more λ or c quarks a hadron contains, the heavier it will be. If the ground (unexcited) states of hadrons are compared, this is precisely the pattern that is observed (see Table 1, as well as Tables 3 and 5). Since quarks have spin 1/2, the quark structure considered above infers integral spin for mesons and half-integral spin for baryons, which is in complete agreement with experiment. In this case, in states corresponding to an orbital moment l = 0—in particular, in the ground state—the spin of mesons should be 0 or 1 (for antiparallel ↑ ↓ and parallel ↑ ↑ orientation of quark spins), whereas the spin of baryons should be 1/2 or 3/2 (for spin configurations ↓ ↑ ↑ and ↑ ↑ ↑). Taking into account that the intrinsic parity of the quark-antiquark system is negative, the values of Jp for mesons at l = 0 are equal to 0 – and 1–, and for baryons, 1/2+ and 3/2 +. It is precisely these values of Jp that are observed in hadrons that have the least mass at given values of l and 5 (see Table 1). Since the subscripts i, k, and l in the structural formulas can take on the values 1, 2, 3, or 4, the number of mesons Mik with a given spin should equal 16. For baryons Bikl the maximum possible number of states with a given spin (64) is not realized, since, by virtue of the Pauli exclusion principle, the only allowed three-quark states for a given total spin are those that have a well-defined symmetry with respect to permutations of the subscripts i, k, and l: completely symmetric for spin 3/2 and of mixed symmetry for spin 1/2. When l = 0, this condition assumes 20 baryonic states for spin 3/2 and 20 for spin 1/2. properties of the quark system; the determination of mass requires knowledge of the dynamics of quark interaction and the mass of the quarks, a knowledge presently lacking. 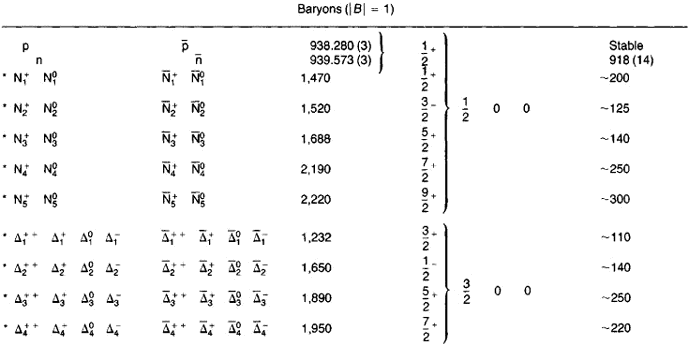 Tables 3, 4, 5, and 6 give the quark structures implied by the described conceptions for the (0–) and (1–) mesons and the (1/2 + ) and (3/2 + ) baryons and their agreement with known particles (the observed particles are underlined). The required summation over the quark colors is assumed everywhere in the tables. These tables show that all ordinary and strange hadrons that should exist with the given quark structure have been experimentally observed. There are as yet no complete data for hadrons with Ch ≠ 0; however, the particles that have been investigated correspond completely to the given pattern. The quark model, correctly conveying the particulars of hadrons with the lowest masses and spins at given values of 5 and Ch, also explains in a natural way the overall large number of hadrons and the predominance of resonances among them. The multiplicity of hadrons is a reflection of their complex structure and the possible existence of different excited states of quark systems. The possibility that the number of such excited states is unlimited has not been excluded. All excited states of quark systems are unstable relative to fast transitions through strong interactions to lower lying states. These states make up the major portion of the resonances. A small number of resonances consist of quark systems with parallel spin orientation (with the exception of Ω–). Quark configurations with antiparallel spin orientation that are in the ground state make up the quasi-stable hadrons and the stable proton. 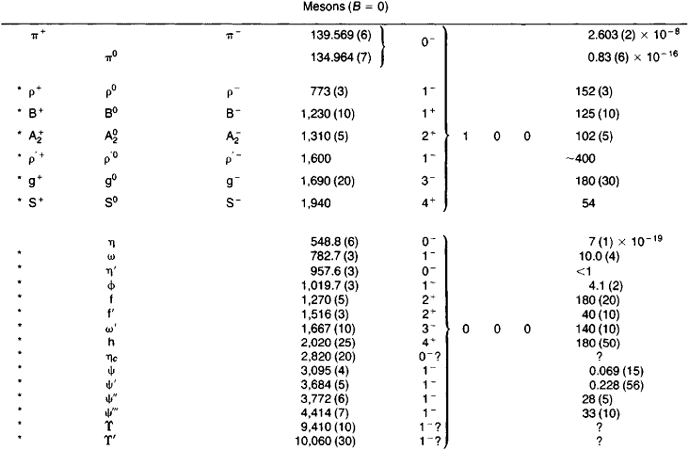 The mesons ρ′ and ψ′ are examples of radial excitations of ρ- and ψ-mesons, respectively (see Table 1). Orbital and radial excitations generate sequences of resonances, corresponding to the same initial quark structure. The lack of reliable data on quark interactions so far precludes quantitative calculations of spectra of excitations or any conclusions about the possible number of such excited states. Note: Subscript a and brackets indicate antisymmetrization; subscript s and braces indicate symmetrization. In formulating the quark model, the quarks were treated as hypothetical structural elements, making possible a very convenient description of hadrons. Subsequent experiments enabled scientists to consider quarks as real material formations within the hadrons. The first such experiments were on the scattering of electrons by nucleons at very large angles. These experiments (1968), reminiscent of Rutherford’s classical experiments on the scattering of alpha particles by atoms, revealed that point charged formations are present within the nucleón. A comparison of the data of these experiments with similar data on the scattering of neutrinos by nucleons (1973–75) made it possible to deduce the average value of the square of the electric charge of these point formations. The results were remarkably close to the quantity 1/2[⅔e)2 + (⅓e)2]. A study of the process of hadron production upon the annihilation of an electron and positron, which presumably follows the sequence e+ + e– → q + q̄ → hadrons, has shown that there are two groups of hadrons genetically associated with each of the formed quarks; this made it possible to determine the spin of the quarks, which turned out to be 1/2. The total number of hadrons produced in this process also shows that quarks of three varieties arise in an intermediate state; that is, quarks occur in three colors. Thus, the quantum numbers of the quarks, introduced on the basis of theoretical considerations, have been confirmed in a number of experiments. Quarks are gradually acquiring the status of new elementary particles. If future research confirms this, then quarks are serious contenders for being truly elementary particles for the hadronic form of matter. Quarks behave like structureless point formations down to lengths of ~10–15 cm. The number of known quarks is not large. Of course, this may change in the future; there is no way of knowing whether or not at higher energies hadrons will some day be discovered with new quantum numbers that owe their existence to new types of quarks. The detection of T-mesons confirms this viewpoint. However, it is entirely possible that the number of quarks will not increase greatly or that there exist general principles that impose limitations on the total number of quarks, although these limitations are as yet unknown. It is also possible that the lack of a structure in quarks only reflects the level that has been reached in the study of these material formations. However, a number of features specific to quarks suggest that quarks are particles that close the chain of structural components of matter. Quarks, unlike other elementary particles, have not yet been observed in the free state, although there is evidence that they do exist in the bound state. One of the reasons for the failure to observe quarks may be their very great mass, which precludes their production at the energies of existing accelerators. However, it is possible that quarks simply cannot exist in the free state by virtue of the specifics of their interaction. There are theoretical and experimental arguments to the effect that the forces acting between quarks do not weaken with distance. This means that infinitely great energy is required to separate quarks; in other words, it is impossible for quarks to arise in the free state. The impossibility of isolating quarks in the free state makes them a completely new type of structural unit of matter. For example, it is not clear whether we can legitimately pose the question of component parts of quarks if quarks themselves cannot be observed in the free state. It is possible that under these conditions parts of quarks have no physical manifestation at all, and therefore quarks appear to be the last subdivision of hadronic matter. Elementary particles and quantum field theory. In describing the properties and interactions of elementary particles in the present theory, of particular significance is the concept of a physical field, which is placed in correspondence with each particle. The field is a specific form of matter, described by a function given at all points (x) of space-time and having certain transformational properties with respect to Lorentz group transformations (scalar, spinor, vector, and so forth) and groups of “internal” symmetries (isotopic scalar, isotopic spinor, and so forth). Historically, the first example of a physical field was an electromagnetic field, having the properties of a four-dimensional vector Aµ (x) (µ, = 0, 1, 2, 3). The fields associated with elementary particles have a quantum nature, that is, their energy and momentum are made up of an aggregate of separate batches, or quanta. In this case, the energy Ek and the momentum pk of a quantum are related by a formula of the special theory of relativity: . Each such quantum is an elementary particle with given energy Ek, momentum pk, and mass m. The quanta of the electromagnetic field are photons, and the quanta of other fields correspond to all known elementary particles. Thus, the field is a physical reflection of the existence of an infinite aggregate of particles—quanta. The special mathematical apparatus of quantum field theory makes it possible to describe the production and annihilation of a particle at every point x. The transformational properties of the field determine all the quantum numbers of elementary particles. The transformational properties with respect to space-time transformations (Lorentz group) give the spin of the particles. Thus, the scalar has a corresponding spin of 0, the spinor has a spin of 1/2, the vector has a spin of 1, and so forth. The existence of such quantum numbers as L, B, I, S, and Ch and of color for quarks and gluons is implied by the transformational properties of fields with respect to transformations of inner spaces (charge space, isotopic space, unitary space). That quarks have color in particular is due to a special colored unitary space. The introduction of inner spaces in the theory is as yet a purely formal device, which, however, may serve as an indication that the dimensionality of physical space-time, reflected in the properties of elementary particles, is actually greater than four, which is the dimensionality of space-time typical of all macroscopic physical processes. The mass of elementary particles is not directly associated with the transformational properties of fields; it is an additional characteristic of particles. The description of the processes of elementary particles necessitates knowledge of how the different fields are related, that is, knowledge of the dynamics of fields. In the current formalism of quantum field theory, information on the dynamics of fields is included in a special quantity expressed in terms of fields, the Lagrangian L (or more precisely the density of the Lagrangian). In principle, knowledge of L makes it possible to calculate the probability of transitions from one aggregate of particles to another under the influence of different interactions. These probabilities are given by the scattering matrix (W. Heisenberg, 1943) expressed in terms of L (seeSCATTERING MATRIX). The Lagrangian L comprises the Lagrangian L0, which describes the behavior of free fields, and the interaction Lagrangian L1, constructed from the fields of different particles and reflecting the possibility of their mutual transformations. A knowledge of L1 is critical in describing processes of elementary particles. The form of L0 is uniquely determined by the transformational properties of fields with respect to the Lorentz group and by the requirement of invariance with respect to the group (relativistic invariance). However, the criteria for finding L1 were long not known (except for electromagnetic interactions), and the existing information on the interactions of elementary particles, obtained principally from experiments, did not permit a reliable choice to be made from among the different possibilities. Under these conditions, a phenomenological approach to the description of interactions was widely favored, based either on selecting the simplest forms of L1 leading to the observed processes or on a direct investigation of the characteristic properties of the elements of the scattering matrix. In this way, considerable success was achieved in describing processes involving elementary particles for various separate energy regions. However, many parameters of the theory were experimentally obtained, and the approach itself could not claim to be universal. Considerable progress was made in understanding the structure of L1 in the 1950’s, 1960’s, and 1970’s, which made it possible to refine its form for the strong and weak interactions. The elucidation of the close relationship between the symmetry properties of elementary particle interactions and the form of L1 played a decisive role in this advancement. The symmetry of elementary particle interactions is manifested in the existence of the laws of conservation of certain physical quantities and consequently in the conservation of the associated quantum numbers of the elementary particles (seeCONSERVATION LAW). Exact symmetry, which occurs in all classes of interactions, corresponds to the presence of rigorous quantum numbers for elementary particles; approximate symmetry, which is typical of only certain classes of interactions (strong, electromagnetic), leads to the nonrigorous quantum numbers. The difference noted above in classes of interactions with respect to conservation of the quantum numbers of elementary particles reflects the differences in their symmetry properties. where are the currents consisting of the particle fields and are the vector fields, often called gauge fields. Thus, the requirement for the locality of internal symmetry fixes the form of L1 and differentiates vector fields as the universal carriers of interactions. The properties of vector fields and their number n are determined by the properties of the internal symmetry group. If symmetry is exact, the mass of a quantum of the field is zero. For approximate symmetry, the mass of the vector field quantum is different from zero. The form of the current is determined by fields of particles with nonzero quantum numbers associated with the internal symmetry group. It has been possible to approach the problem of the interaction of quarks in the nucleón on the basis of the principles outlined above. Experiments on the scattering of neutrinos and antineutrinos by nucleons have shown that only part (about 50 percent) of the nucleón momentum is transferred by quarks, the rest being transferred by another kind of matter, which does not interact with neutrinos. Presumably, this portion of matter consists of particles that are exchanged by the quarks and that are responsible for quark confinement in the nucleón. These particles have been named gluons (from the word “glue”). In line with the discussion on interactions presented above, it is natural to assume that these are vector particles. In contemporary theory their existence is linked with the symmetry that manifests color in quarks. If this symmetry is exact (colored SU(3) symmetry), then gluons, of which there are eight, are massless particles (the American physicist Y. Nambu, 1966). The interaction between quarks and gluons is given by L1 with structure (2), where the current consists of quark fields. There is reason to believe that quark interaction mediated by the exchange of massless gluons leads to forces between quarks that do not diminish with distance, but this has not been rigorously proved. In principle, knowledge of the interaction between quarks may provide the basis for describing the interaction of all hadrons with one another, that is, all strong interactions. This direction in the physics of hadrons is developing rapidly. Here, and are the charged and neutral currents of the weak interactions, the components of the currents being lepton fields; , and are fields of vector particles that are massive because of symmetry violation, and in this scheme they are the carriers of weak interactions; that is, they are intermediate bosons. Aμ is the field of the photon. The idea of the existence of a charged intermediate boson was suggested long ago (Yukawa, 1935). However, it is important in the given model of a unified theory of electromagnetic and weak interactions that the charged intermediate boson is on an equal footing with the photon and the neutral intermediate boson. Processes of the weak interactions caused by neutral currents were discovered in 1973, which confirms the validity of the approach we have just outlined in formulating the dynamics of the weak interactions. Other ways of writing the Lagrangian L1weak with a greater number of neutral and charged intermediate bosons are also possible; experimental data are still insufficient for a final choice of the Lagrangian. Intermediate bosons have not yet been experimentally observed. From available data, the masses of W± and Z0 for the Weinberg-Salam model are estimated at approximately 60 and 80 GeV. The electromagnetic and weak interactions of quarks can be described within the framework of a model similar to the Weinberg-Salam model (S. Glashow, J. Ilioupulous, L. Maiani, 1970). Such an analysis of the electromagnetic and weak interactions of hadrons agrees well with observed data. A general problem encountered in the construction of such models is that the total number of quarks and leptons is still not known, which makes it impossible to determine the type of initial symmetry and the nature of symmetry violation. Consequently, further experimental studies are very important. The common origin of the electromagnetic and weak interactions signifies that the constant of weak interactions disappears in the theory as an independent parameter. The only constant that remains is electric charge e. The suppression of weak processes at low energies is explained by the large mass of the intermediate bosons. At energies in the center-of-mass system, which are comparable to the masses of intermediate bosons, the effects of electromagnetic and weak interactions should be of the same order of magnitude. The latter, however, will differ in the nonconservation of several quantum numbers, for example, P, S, and Ch. Attempts have been made to unify not only the electromagnetic and weak interactions but also the strong interactions. The starting point for such attempts is the hypothesis of the unified nature of all the interactions of elementary particles except the gravitational. The observed considerable differences between the interactions are attributed to strong violation of symmetry. These attempts have not yet been adequately developed and serious difficulties have arisen, especially in explaining the differences in the properties of quarks and leptons. The development of a method of obtaining an interaction Lagrangian based on symmetry properties has proved to be a major step toward a dynamic theory of elementary particles. There is every reason to believe that gauge field theories will be an essential feature of further theoretical developments. Some general problems of the theory of elementary particles. The most recent development in elementary particle physics clearly delineates a group of particles that essentially determine the specifics of the processes in the microworld. These particles are possible truly elementary particles. Among them are particles with spin 1/2 (leptons and quarks), as well as particles with spin 1 (gluons, the photon, massive intermediate bosons) that bring about different forms of interactions of particles with spin 1/2. Quite probably, this group should also include a particle with spin 2, the graviton, the gravitational field quantum that links all elementary particles. However, in this scheme there are many problems that need further study. Still not known is the total number of leptons, quarks, and various vector particles (with J = 1) and whether there are physical principles that determine this number. The reasons for the division of particles with spin 1/2 into two different groups, leptons and quarks, are not clear. Also unclear is the origin of the inner quantum numbers of leptons and quarks (L, B, I, S, Ch) or the color characteristic in quarks and gluons. Not known is the number of degrees of freedom with which the inner quantum numbers are associated. Only characteristics of elementary particles like J and P are associated with ordinary four-dimensional space-time. What mechanism determines the masses of truly elementary particles? Why do elementary particles have different classes of interactions with different symmetry properties? The future theory of elementary particles is faced with solving these and other problems. As we have mentioned, gauge theories attempt to describe the interactions of elementary particles. These theories have a well-developed mathematical apparatus that makes it possible to calculate processes involving elementary particles (at least in principle) on the same level of rigor as in quantum electrodynamics. However, in their present form, such theories have one serious disadvantage in common with quantum electrodynamics: meaningless infinitely long expressions arise in the course of theoretical calculations. A special technique of redefining the observed quantities (masses and charge)—renormalization—is used to eliminate the infinities in the final calculation results. In the most thoroughly investigated electrodynamics this has not yet affected agreement between theory and experiment. However, the renormalization procedure is a purely formal way of circumventing the existing difficulties in the apparatus of the theory, and on some level of accuracy it should show up in the agreement of calculations with measurements. The appearance of infinities in the calculations is linked with the fact that fields of different particles are referred to the same point x in the interaction Lagrangians; that is, it is assumed that we are dealing with point particles and that there is no curvature of four-dimensional space-time even down to the very shortest distances. In reality, these assumptions are apparently not valid for several reasons: (1) truly elementary particles are most probably material objects of finite size; (2) the properties of space-time in the small (on scales determined by the fundamental length) are most likely radically different from its macroscopic properties and (3) at the shortest distances (~10–33 cm), changes in the geometric properties of space-time owing to gravitation are evident. It is possible that these causes are intimately linked. Thus, it is precisely the consideration of gravitation that most naturally leads to dimensions of truly elementary particles of the order of 10–33 cm, and the fundamental unit of length l0 may be associated with the gravitational constant . Any of these reasons should lead to a modification of the theory and the elimination of infinities, although the practical implementation of this modification may be quite complicated. It is very interesting to account for gravitation at short distances. The gravitational interaction may not only eliminate discrepancies in quantum field theory but may be responsible for the very existence of the fundamental constituents of matter (M. A. Markov, 1966). If the density of the substance of truly elementary particles is large, gravitational attraction may be the factor that determines the stable existence of these material formations. The dimensions of such formations must be ~10–33 cm. In most experiments they will behave like point objects, and their gravitational interaction will be negligibly small and will show up only at the shortest distances, in the region where there is an appreciable change in the geometry of space-time. Thus, the emerging tendency toward the simultaneous consideration of different classes of elementary particle interactions should most probably see its logical culmination in the incorporation of gravitational interaction into a general scheme. It is precisely on the basis of the simultaneous consideration of all forms of interactions that we can most likely expect the development of a future theory of elementary particles. Markov, M. A. Oprirode materii. Moscow, 1976. Perkins, D. H. “Neutrinos and Nucleon Structure.” Contemporary Physics, 1975, vol. 16, no. 2. Zakharov, V. I., B. L. Ioffe, and L. B. Okun’. “Novye elementarnye chastitsy.” Uspekhi fizicheskikh nauk, 1975, vol. 117, issue 2, p. 227. Bogoliubov, N. N., and D. V. Shirkov. Vvedenie v teoriiu kvantovannykhpolei, 3rd ed. Moscow, 1976. At the moment in history when ideas of man typified by Hobbes's theories emerged as precursors of the modernist "death of man" reduced to a bundle of impulses or helplessly propelled by external forces, Milton's poem "has some claim to being an imaginative vindication of the huma nistic idea that persons and their values are at least as much a part of the basic structure of reality as elementary particles and their powers" (227). Light would stop shining and matter would disintegrate into a chaotic soup of elementary particles no longer obeying the normal laws of physics. Advance proofs of The Elementary Particles (as Michel Houellebecq's novel is called in English) arrived on our desk recently. The foundation of this science as an unavoidable stage of internal development and cosmology and also the physics of elementary particles, together with the main principles are only some of the topics discussed in the book. The 'ghost particle of the Universe' is a key to open issues in science on many scales, linking the microcosm of elementary particles to the largest structures in the Universe," the KATRIN website explains on its (http://www. The particles are each made up of four quarks, elementary particles known for their role as the building blocks of protons and neutrons. Just as electrons are elementary particles in our universe, Bloch electrons can be considered the elementary particles of a solid. The elementary particles consist of leptons and hadrons, i.
of Technology, Goteborg, Sweden), chemical physics deals with the quantum mechanical behavior of the elementary particles, atoms, and molecules. With the LHC due to restart only in November at CERN near Geneva, Switzerland, the Tevatron has been gaining ground in the search for the Higgs, the particle thought to give mass to other elementary particles.